This Live Blog session closed at 16:01 on 14 Jun 2018. Hello and welcome to the FT’s live coverage of the ECB’s latest monetary policy decision and press conference. It will be one of the most closely-watched days in recent ECB history as the central bank mulls a withdrawal from quantitative easing later this year. 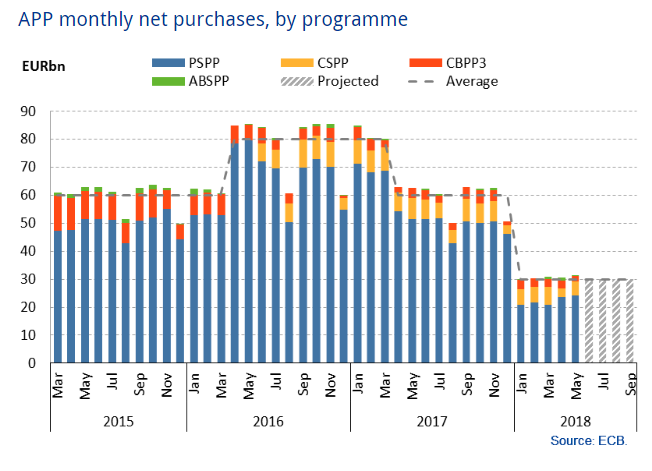 The immediate question is whether the ECB will commit to ending its asset purchase programme – it is widely expected to cut purchases from the current level of €30bn a month in September to zero by the start of 2019. But investors are watching for clues on when, and how fast, the ECB will start raising interest rates from historic lows. And they want more information on when the central bank might stop reinvesting the proceeds of QE, and so begin shrinking its balance sheet in a way that will tighten monetary conditions. Claire Jones, the FT’s correspondent in Frankfurt, has put together an explainer telling us what to watch for. You can find that here. We are expecting the ECB press release at 12.45pm London time, followed by a press conference by ECB president Mario Draghi at 1.30pm. The ECB governing council is in Riga, Latvia, today. You can watch live here. The ECB has been buying €30bn of European bonds each month since the start of the year, down from €60bn a month last year. It has accumulated a significant proportion of the total market for eurozone sovereign paper, meaning that the question of when to bring the programme to an end is becoming increasingly pressing. The ECB is also going to be updating its forecasts for the eurozone economy. If they do signal any plans to tighten policy, it will be interesting to see how they square that with recent data – which has been pretty soft since the last meeting in April. 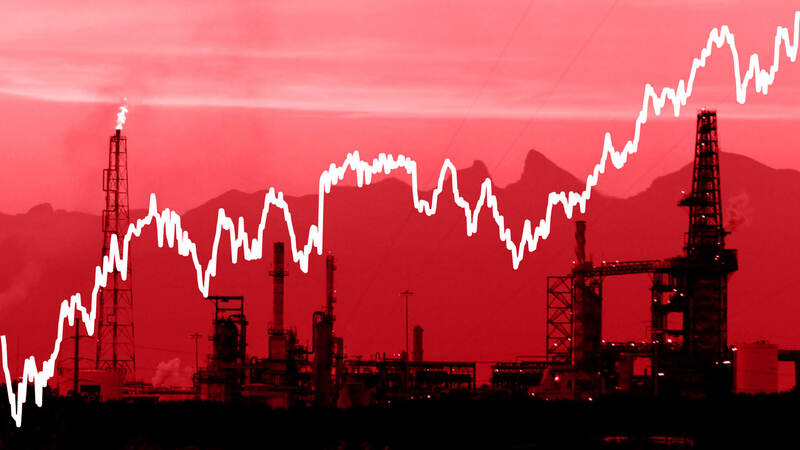 Inflation did come close to the 2 per cent target last month, but that was mostly due to the rise in oil prices, not to underlying price pressures. 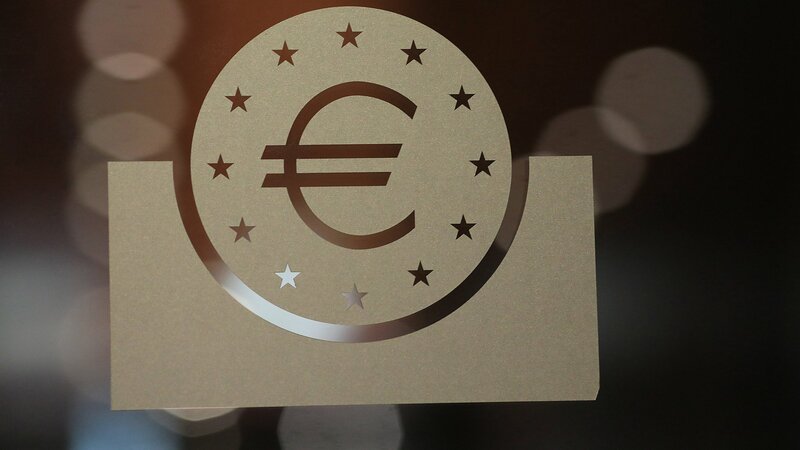 The markets are quiescent ahead of the ECB’s announcement, with the euro up 0.3 per cent at $1.1824, leaving its fall over the year to date at around 1.6 per cent. Italian government bond yields have edged upwards, reflecting some investor nerves. The two-year yield is up 11 basis points on the day to 1.071 per cent. The 10-year yield is up 10 basis points at 2.915 per cent. But they are still well off their peaks in late May at the height of the political uncertainty. The European markets have been roiled in recent weeks by the political drama in Italy as two populist parties forged a governing coalition. 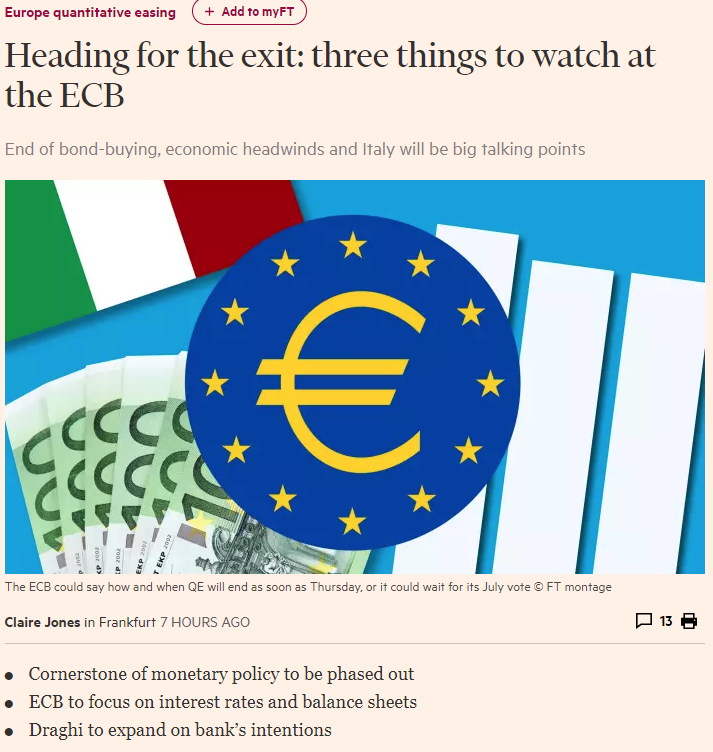 The return of eurozone political risk to the forefront of investors’ minds saw Italian bond yields spike, while the gap between German and Italian yields – a widely-watched indicator of political risk sentiment – rose sharply. At least some members of the governing council are inclined to see the soft patch as temporary though. Here’s a way of looking at the inflation data – courtesy of economists at Jefferies – that might support a more hawkish interpretation. Here’s a couple of thoughts from some of the market analysts. Rate hike expectations are still more dovish than they were pre-Italy, so there is still a little room for a hawkish surprise if the ECB were to emphasise confidence in the economic recovery and minimal concern around Italian bonds,” says Oliver Brennan, senior macro strategist at TS Lombard. We forecast a reduction to the pace of purchases to €15bn/month in 4Q 2018, with QE ending in December,” says Fabio Bassi, global rates strategist at JP Morgan. Here’s a flavour of what some economists are expecting. 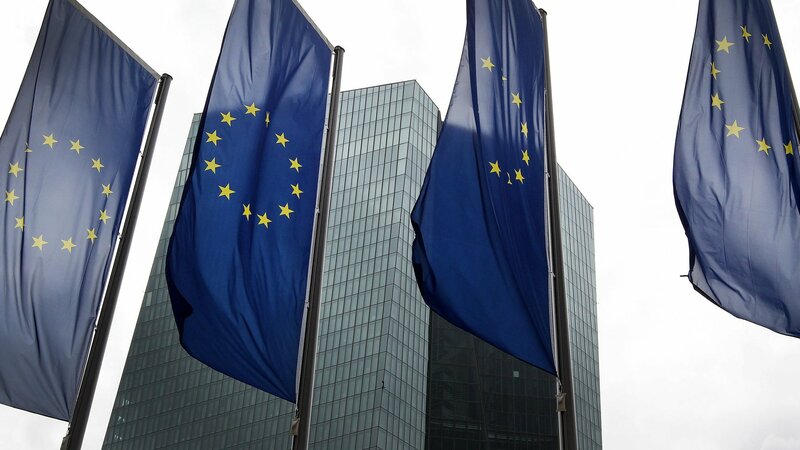 Despite growing uncertainty around the strength of the eurozone recovery, little underlying inflationary pressure and possible further market turmoil, the European Central Bank seems determined to focus on long-term trends…. the only question is how much detail the ECB will be willing to present. We still don’t think the central bank will easily give away flexibility and room for manoeuvre on quantitative easing in a situation where downside risks to the economic outlook have increased and political risks (be it from Italy or later this year from Brexit) could easily reemerge. It is a close call between trying to buy more time with hawkish words and announcing explicit details. Given Praet’s comments, we expect the ECB to announce another recalibration of QE, i.e. an extension of QE at a reduced pace of €10 billion per month at least until December 2018. There is a sizeable proportion of forecasters that expect a concrete announcement of policy changes, which we think is not very likely. As we argued last week, we think it is much more likely that the ECB announces that a concrete plan will be forthcoming in July. Furthermore, we think that it will be hard for markets to price in ‘more’ in terms of rate hikes… market rates imply a steady march higher after the expected start in June 2019 – despite other major central banks, most notably the Fed – seen on hold. “at this point in the process, a few months and a few extra billion in purchases either way are not crucial; the markets are more focused on how the ECB amends its interest rate guidance, any technical changes around bond reinvestments and whether Draghi delivers a relatively dovish taper by leaving the door open to the possibility of restarting the programme if the recovery were to splutter. Breaking news The ECB has said it will end its asset purchase programme at the end of December, tapering monthly purchases from €30bn in September to €15bn from October to the end of the year. 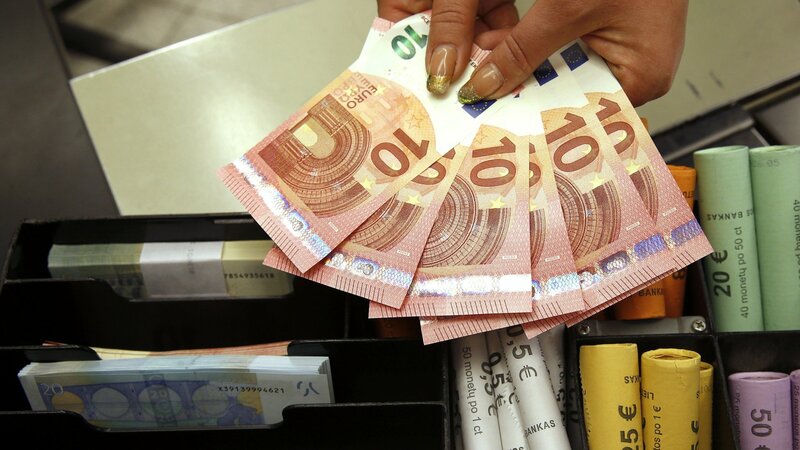 The euro is higher as investors absorb the statement. The shared currency rose by as much as 0.5 per cent on the session, to $1.1851. As the detail from the governing council’s deliberations hit the wires, the euro pared its gains and returned to the flatline at $1.1790. The ECB says that it expects interest rates to remain unchanged “at least through the summer of 2019″, more detail than it had previously provided. There is no change in the language on reinvesting the proceeds of QE – which will continue “for an extended period of time after the end of its net asset purchases”. So no hint yet on when the ECB will start shrinking its balance sheet, and whether this will come before it starts to raise interest rates. In brief: roughly what investors were expecting on the tapering of asset purchases, and a slightly dovish steer on interest rates – markets had previously been betting that the first increase in interest rates could come around the middle of 2019. Eurozone sovereign bond yields are largely unchanged on the news, with the yield on Italian 10-year debt edging up slightly and the German Bund remaining little affected. 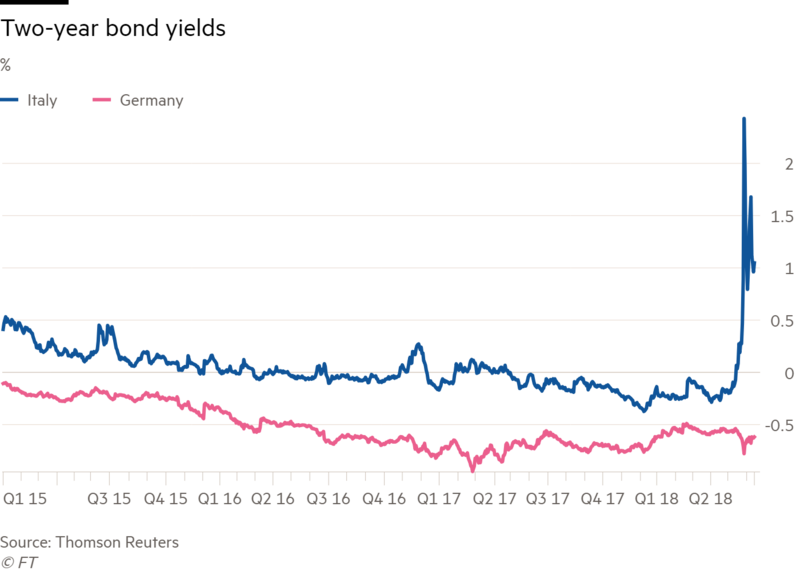 The spread between Italian and German yields – a widely watched indicator of markets’ political risk sentiment – is also little changed. 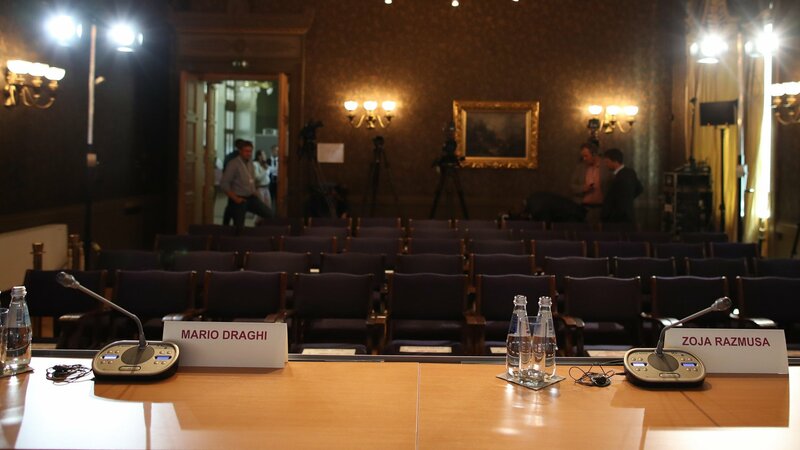 Many investors will be waiting to hear what Mr Draghi has to say at the press conference in half an hour’s time. The shared currency is down 0.6 per cent at $1.1725, failing to hold highs that took it up as much as 0.5 per cent, as the cautious elements in the ECB’s approach dominate reaction. Mario Draghi will be joined at today’s press conference by the deputy governor of the Latvian central bank, Zoja Razmusa. The bank’s governor Ilmars Rimsevics has been mired in a corruption scandal. Some early commentary suggests the euro fall is down to “buy the rumour, sell the fact” price movement, with investors undoing much of the gains the euro had enjoyed in recent days. It is now back around levels against the dollar at which it began the week. There is also some talk about the market shifting attention away from the decision to end asset purcahses after December – which was broadly expected – and towards the likely date of ECB rate hikes. As strategist Viraj Patel at ING tweeted, ” the #ECB gives with one hand (end to QE) and takes away with the other (forward guidance on flat rates)”, while Martin Enlund, forex strategist at Nordea, tweed that its forward guidance on rates was “a bit on the soft side”. The yield on two-year German debt is ticking lower, by 1.6 basis points to minus 0.654 per cent as investors buy the debt. There is also demand for 10-year German Bunds, sending their yield down 2.1 bps to 0.454 per cent. Stock markets are higher after the announcement, turning round from modest intraday declines. “This is a pretty cautious message from the ECB. By saying the QE programme will end this year but not signalling a rate hike until at least next summer Mr Draghi is giving with one hand and taking away with the other. At this stage he’s committed himself to waiting until at least the second half of next year to raise rates. This will comfort markets but we must remember that at this stage it is just a guide and not a guarantee. “Today is mainly going to be symbolic, marking the end of an era in Europe. It tees up the end of easy money and sets the stage for rates to rise next year. So it’s another step on the way to removing the extraordinary global monetary stimulus over the last decade. 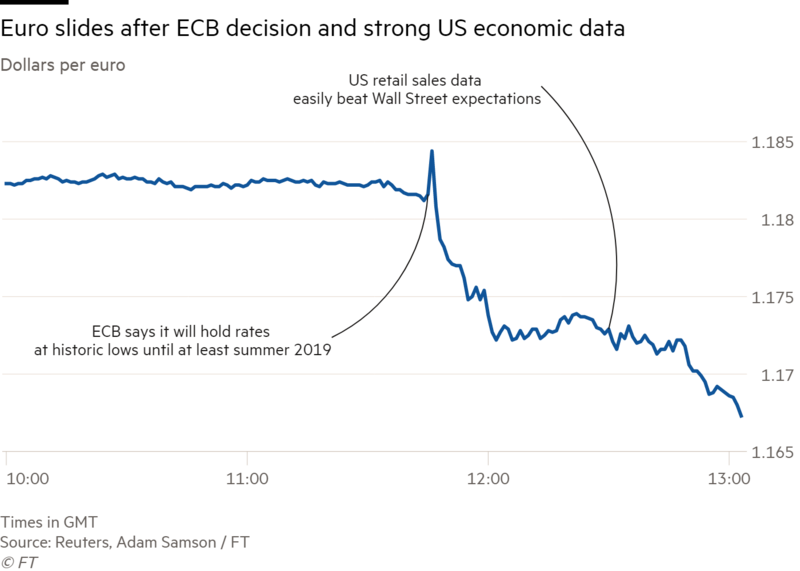 We are in an altogether different world to only a couple of years ago with the Fed raising rates again yesterday and the kind of signal we’ve seen today. The question is whether the bullish outlook can last. Italy’s crisis looms large over the European economy and it is not out of the woods yet by any means. The deep structural issues in countries like Italy lurk barely below the surface. Here comes Mario Draghi, the press conference is about to start. Carsten Brzeski at ING calls the decision a “truly Solomonic compromise between the hawks and the doves”. Hawks get an end date for QE. But a twist in the language – the ECB merely “anticipates” tapering after September – leaves the door ajar for more if needed. Zoja Razmusa, the Latvian central bank deputy governor, sitting next to him. He says there are grounds for confidence that inflation will converge towards the ECB’s target even after winding down net asset purchases. But tapering after September is “subject to incoming data”, needless to say. He says the eurozone still needs significant monetary stimulus – which will come from asset purchases to the end of the year, the sizeable stock of acquired assets, reinvestments and the guidance on key interest rates. 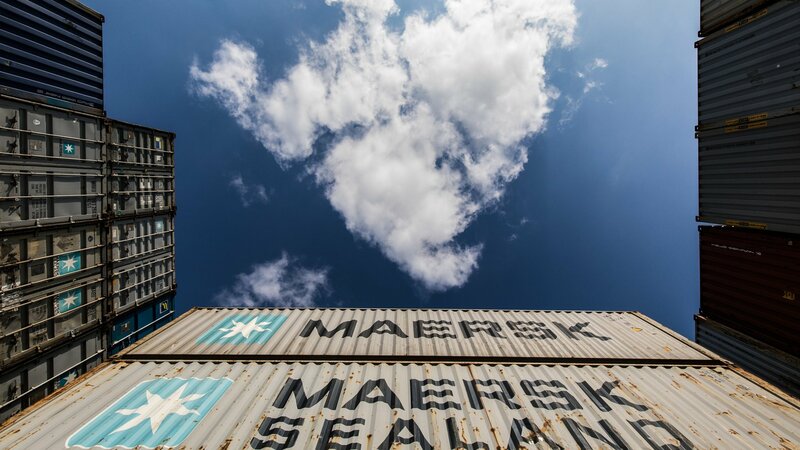 The first quarter slowdown should be seen as a “pullback” from very high growth at the end of last year, he says, as well as a temporary supply shock and weaker impetus from external trade. The latest forecasts are weaker but still consistent with solid, broad-based growth. Annual inflation likely to hover around current level (1.9 per cent) until end of year based on current oil prices continuing. Domestic cost pressures are strengthening and uncertainty around the inflation outlook receding. Underlying inflation should pick up towards the end of the year and pick up in the medium term. ECB has revised up inflation outlook for 2018 and 2019 mainly due to higher oil price though. Now we’re going to questions from the media. The ECB will not be commenting on the situation relating to the Latvian central bank governor, we are told. The ECB has cut its forecast for eurozone growth in 2018 from 2.4 per cent to 2.1 per cent. After that, the forecasts are unchanged at 1.9% in 2019 and 1.7% in 2020. As Draghi takes questions, the FT’s Michael Hunter says the euro is now down 0.6 per cent at $1.1725 — failing to hold highs that took it up as much as 0.5 per cent — as the cautious elements in the ECB’s approach dominates reaction. Your statement says that you expect to keep rates on hold through next summer. Do you expect to be able to raise rates at least once in your term? And could you describe the assessment of the risks around the political and economic situation in Italy and how this might affect your outlook? 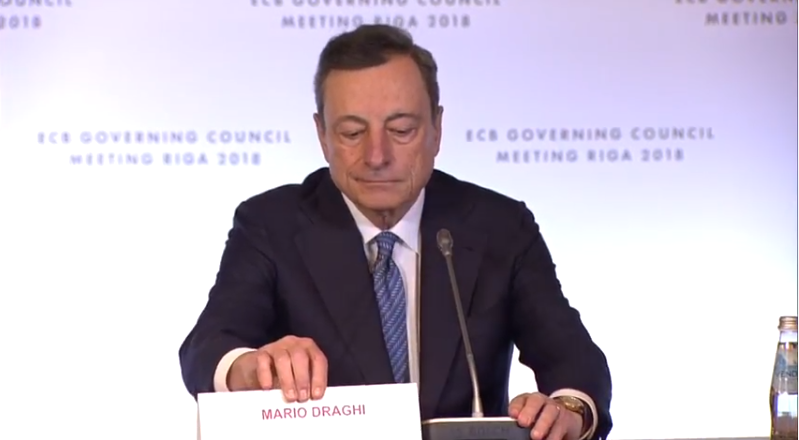 Mr Draghi is re-reading part of his statement. News is still solid – not as good as it was but still good. Growth is still high. There has been an undeniable increase in geopolitical uncertainty. The assessment the governing council gave of the underlying strength of the economy, while overall appropriate for achieving the decisions we’ve taken today, does not want to underplay the existing risks. We may well have this soft patch being somewhat longer than in the staff projections in some countries, for example. But the underlying strength of the economy in the medium term is adequate. The FT’s Claire Jones asks what happens after the first rate hike – which is in any case more an expectation than an intention. Was there any discussion of giving stronger guidance? Second: the incoming data has been weak but you say risks to the outlook are balanced. Where are the upside risks? Mr Draghi’s answer: we are taking these actions based on the current assessment, knowing that the economy is in a better situation but with increased uncertainty. Some information has come in after the forecasts were finalised, the soft patch may last a little longer in some countries. But the governing council judges inflation to be on a trajectory consistent with target. An update from the FT’s Michael Hunter on European bourses wich are trading higher on the day now, bouncing up from earlier declines. Frankfurt’s Xetra Dax 30 is up 0.4 per cent overall, while the Cac 40 in Paris is up 0.7 per cent. The Europe-wide Stoxx 600 is up 0.3 per cent. On the balance of risks, Mr Draghi says there is an “unquestionable increase” in geopolitical – and perhaps domestic – uncertainty. But there could be positive surprises from fiscal expansion in the US and very likely fiscal expansion in the medium term in several countries in the eurozone. Is there any more guidance on how long reinvestments will continue and whether they are tied to the future interest rate hike? And how did the discussions go? Mr Draghi says that the governing council did not discuss reinvestment possibilities. We will address that later on, there was enough to cope with in this meeting. On the nature of the discussion, there was a comprehensive review of the economic environment and looked at whether there was convergence. They compared projections across time and with other sources of information about inflation. By and large they showed a remarkable improvement with respect to not long ago. Then we looked at confidence and whether we can be confidence of these findings. We looked at market based and professional forecasts. We can declare ourselves confident of our findings. Finally, we looked at resilience. Is it durable and self-sustaining? The answer was positive. Market reaction to our announcement shows it is a self sustaining convergence. However continuing convergence is contingent on remaining patient, prudent and persistent in our policy. This was unanimously confirmed. Draghi’s really emphasising that the governing council was unanimous about maintaining “optionality” on all parts of the decision. Mr Draghi is talking about what the council’s unanimity means. 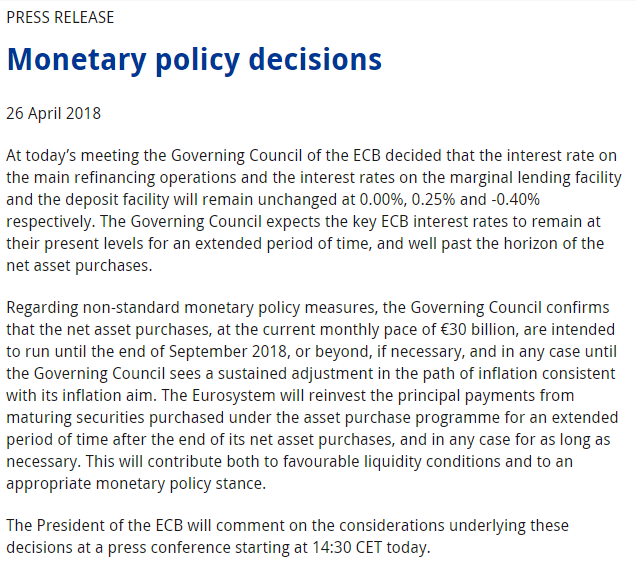 There is a desire to maintain optionality in each part of this decision – in interest rates, and the extended period of reinvestment which intends to avoid any tightening of the excess liquidity conditions, and in keeping the key ECB rates in place until at least next summer. He is again reading from the statement, emphasising that the council is willing to adjust its policy if the economic improvement is not sustained. It is subject to incoming data, he emphasises again. 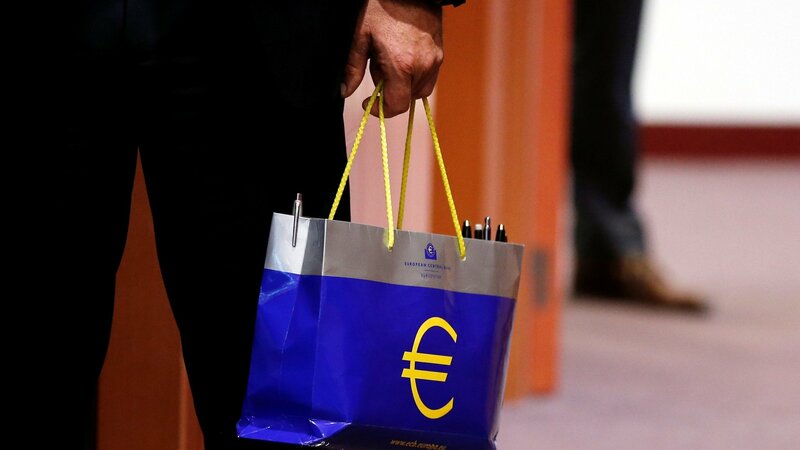 The FT’s Michael Hunter reports the euro is now down 0.8 per cent at $1.1690, with its decline against the dollar intensifying after the release of forecast-beating US data, which showed retail sales growth of 0.8 per cent for May, double the 0.4 per cent predicted. 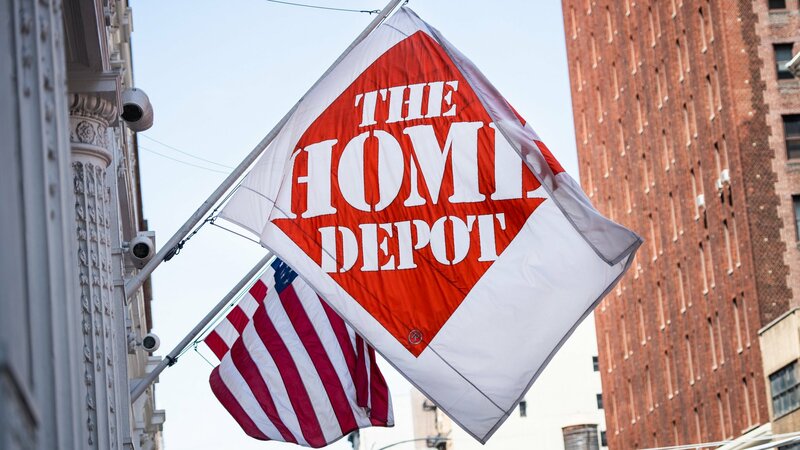 The strength in US retail sales data has encouraged dollar bulls, with the Federal Reserve already further down the path toward normalised monetary policy. Over 2018, the euro is now down by over 2.5 per cent against the dollar. The asset purchase programme is not disappearing, he says – it is a new instrument of monetary policy that will be used for future contingencies. Let’s emphasise again – the use of asset purchases is not disappearing. It’s a part of the normal toolkit and it will be used again in future, when circumstances require. Next question: what other tapering options did you discuss? Was any other option discussed? And regarding Latvia – how damaging is the recent scandal involing the Latvian central bank’s governor Ilmars Rimsevics? Draghi says they haven’t discussed other policy options. This set of decisions had unanimity. He declines to answer the question about the scandal citing the ongoing court case and his earlier statement that he would not be addressing that issue. 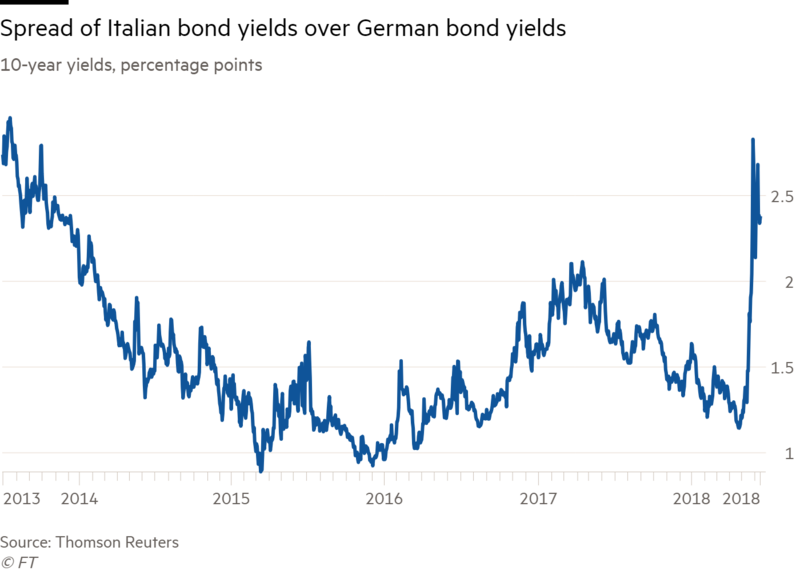 The recent market voliltility has stunned investors because of the scale of the fall in eurozone government bond prices and the contagion from Italy which also hit French spreads. It looked like a repricing of redenomination risk. What is your assessment of what happened in the markets? And there was a lot of discussion in Italy of how the ECB reinvests into government bonds. We don’t know the parameters of the reinvestment. Can you give us more information? Mr Draghi says we’ve seen a significant rise in sovereign yields, but we haven’t seen really any redenomination risk and contagion was not significant if any. It was a pretty local episode. There was a discussion in 2011 and 12 about redenomination risk but it’s important to remember that situation was very different – a lack of confidence attacking several countries at once and financial tensions were far more extreme. The institutional framework of the euro was not as developed as it is today. We now have several new safeguards. So I don’t think the redenomination risk was meaningful today, he says. Mr Draghi adds that the ECB monitors financial and market developments closely. On reinvestment, he says the governing council wishes to avoid a tightening of financial conditions and it will discuss the mechanics of reinvestment in time. They will look at market expectations but he does not want to say any more than that at the moment because it was not discussed today. He wants to add something about the sharp repricing in sovereign debt last month. Firstly we should not dramatise changes of policy too much. With 19 countries we will see elections now and then and it may well be that differing views are expressed by the electorates. What is important is that those views and discussions will be carried out within the existing treaties, even if they are about contemplating changes. It is important these discussions do not destroy the progress that has been achieved. It is just the beginning of this progress. Some countries have done well for many years but others are just starting to so it is important the discussions are carried out with language that does not destroy the progress we have made. Fourthly, he says, the euro has 74% support across the eurozone. More countries want to join. So you can draw your conclusions. One conclusion is that it is irreversible because it is strong, people want it and it is no benefit to anyone to discuss the existence of the euro. A question from German TV: the ECB has four criteria for ending asset purchases, but it’s hard to see any of them fulfilled enough to justify today’s decision. Can he comment? Secondly: European citizens’ main interest is to know when they will see interest rates at a more “normal” level. Would he dare a prognosis on when? The answer to the 2nd question, Draghi says, is in the statement: interest rates expected to remain at their present level at least through the summer of 2019. However, these policy rates being as low as they are don’t imply that – as often claimed – savers are being deprived of income. Savers can invest in other assets. Bank profitability – and that of pension funds – is improving. All these people benefit more from a recovering economy than they were harmed by low rates. The balance is vastly positive. 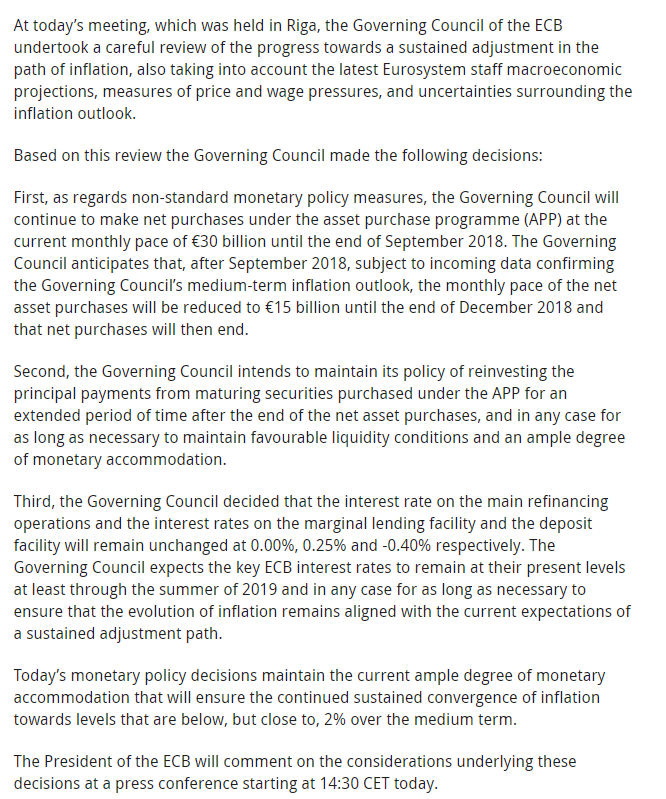 To answer the first question, the governing council discussed whether inflation was converging enough on our objective. Looking at both headline and core inflation, compared with the same measures in 2015 or 2016, the progress has been remarkable. Are we confident this convergence will continue? The governing council has looked at inflation expectations; at the way our forecasts have evolved over time; at the “confidence intervals” around our forecasts; and at the tail risks of deflation, which have disappeared. All this bolsters our confidence. So does the improving labour market, with nominal wage growth – always a key variable – now improving. A question from the Spanish media. Should we assume that ‘summer’ includes the September meeting too? And have you redistributed Vítor Constâncio’s responsibilities? Mr Draghi says that the responsibilities have not yet been reassigned but will be shortly. On the question of ‘summer’ he says that if we meant September, we would have said September. Next question: what is your answer to populist parties and others who doubt the euro? And German economists are arguing that there should be a possibility of exiting the euro? Draghi: it doesn’t pay to discuss reversing something that is irreversible! That’s it. 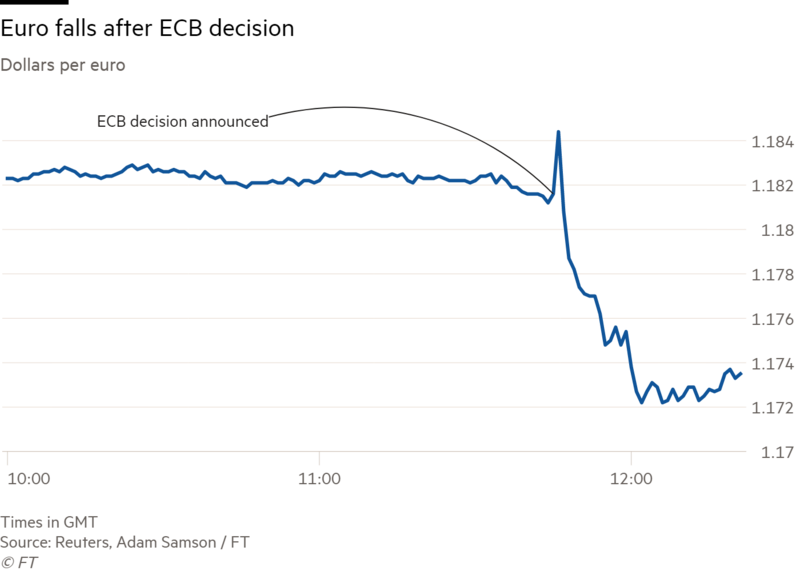 The FT’s Michael Hunter reports that the shared currency is down 1 per cent at $1.1672 at a seven-session low — failing to hold highs that took it up as much as 0.5 per cent earlier — as the cautious elements in the ECB’s approach continues to dominate reaction. Dollar bulls are also taking encouragement from US retail sales data that came in significantly ahead of forecasts. Should we understand that you won’t change rates til the end of the summer? Or could it be any time in the summer? And regarding reinvestments, will you discuss details in July or is that too early? Also, Germany seems on the verge of a political crisis with Mrs Merkel’s authority being called into question in her own party. Do you worry about political instability in the biggest euro country might lead to difficulties in reforming the euro area? Mr Draghi says he can only reiterate what he has already said about rates remaining on hold “at least” through the summer – the intention is to give a time dimension but not a precise one. 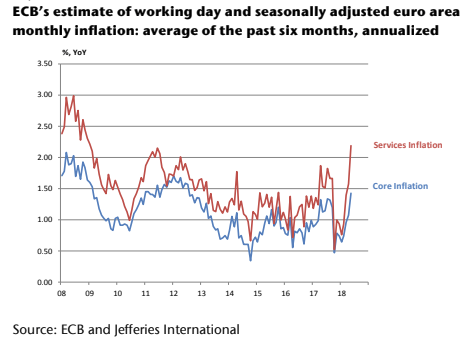 It is data-contingent and would be difficult to specify a precise time at which the ECB will reach the level of convergence it has been aiming at for the last six years. He reiterates the general uncertainty that has increased in the previous weeks. We have not decided when we will discuss reinvestment, Mr Draghi says. It is not a marginal issue at all. We have to be very mindful of the excess liquidity conditions in the markets. We have the remaining purchases this year, we have forma guidance on rates and we have the stock of bonds we have purchased so far, these are all policy options. The question about political instability is too difficult for me, he says. It requires political judgement that goes outside the tasks of a central banker. Question from the New York Times: how could US tariffs and EU retaliation affect the real economy? And how much do you think QE has contributed to the eurozone economy? On trade, Draghi says the ECB’s projections do not contain the effects of measures that have not yet been implemented. The direct effect of measures already implemented is pretty limitied. If the trade war escalates, effects may be more significant. But the most important effect is probably on general confidence. It is more urgent than ever that these discussions are being run within the existing multilateral framework – as important as the nature of the measures discussed. If we undermine the multilateral framework that has accompanied our existence since the end of the second world war we are going to create very serious damage. Our ancestors have been through this already. There is no need to repeat the experience. By pushing back the first rate hike to summer 2019 or later, do you want to avoid the mistake made in 2011? And what do you say to those in Italy who say the ECB bought less Italian bonds in May and that contributed to the spread changes? Mr Draghi says that on rates, they will change depending on the state of the convergence process. He reads from the statement again. He hopes that next year we will be giving a positive assessment of convergence. On Italian bond purchases, the ECB communicated last week on this topic. We should not get obsessed with weekly data. In that month, in May, it was not only Italy but other countries whose share of net purchases went down. This is nothing new. It is the result of rules that had been communicated and agreed a long time ago. There are redemptions which are hard to foresee on a monthly basis so we need a little flexibility to compensate which is exactly what happened in this case. The purchases of Italian bonds in May were higher than in March or January, so there is no conspiracy here. A few takeaways from that press conference for investors to mull …. - Mr Draghi was very emphatic on the future of the euro – it is “no benefit to anyone to discuss the existence of the euro”, as he said several times. - We do not yet know what the ECB’s plan is for reinvesting the proceeds of maturing bonds. The way in which the central bank goes about this could prove crucial in creating a soft landing for asset prices. This will be discussed at a future meeting, he said, although he did not commit to discussing it at the next meeting in Frankfurt in July. - The recent market turbulence in Italian assets was a domestic issue which had very little if any contagion in wider eurozone markets, Mr Draghi said. He seemed keen not to be drawn into commenting on Italian domestic politics, other than to emphasise heavily that any discussion about the future of the single currency should take place through the established institutions and treaties – a clear message to Italy’s governing eurosceptic populist coalition. - He also rebutted the suggestion that the ECB had reduced its purchases of Italian bonds in May, pointing out that the net purchases were in line with previous months and the only reason that it appeared the ECB had taken its foot off the gas was because of a hefty chunk of German redemptions which had to be reinvested, thus hitting several other countries’ net shares of total purchases. There was “no conspiracy” here, Mr Draghi said. And despite pencilling in a date for ending QE, this is hardly a hawkish decision. Mr Draghi said the governing council was still confident of the economy’s underyling strength. But he admits there’s an “undeniable” increase in uncertainty. There are some upside risks, in particular the potential for a boost from US fiscal expansion, while Mr Draghi did his best to play down the implications of Italy’s political upheaval. Right we are going to wrap up our coverage, thanks for joining us.